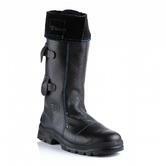 Goliath Blast King Foundry Boots have a manufactured with a heavy duty chrome tanned leather. 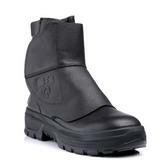 Flame resistant Dual Density Rubber injected sole unit heat resistant up to 300°C. Injection soling process ensures for a consistent bond between the upper and the sole. Quick release fasteners for fast removal in case of molten metal splash. Moisture wicking textile to the vamp only. Steel toe cap resistant to 200 joules and steel midsole. Goliath Blast King Foundry Boots conforms to standards EN ISO 20349:2010 S3 HI HRO SRC FE. 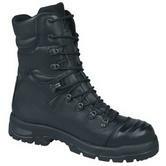 Combat-style safety boot provides top safety rating, great durability and superior comfort. Water resistant full grain leather uppers and moisture wicking lining throughout. Bellowed tongue will keep dust and debris from entering the boot. Dual Density Rubber sole: exceptional abrasion resistance and ideal for environments where oils and solvents are used. Heat resistant to 300°C contact. 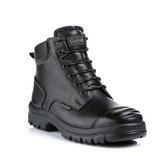 Goliath Groundmaster Combat Safety Boot conforms to: EN ISO 20345:2011 S3 CI HI HRO SRC. Fully water proof liner keeping users feet dry in any condition. Steel midsole granting protection against punctures up to 1100 newtons. Secure fit with a Zip up lace up combination. Conforms to EN ISO 15090. 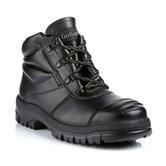 Goliath GoreTex Linesman safety boors are made from thick 2.5 mm full grain leather. Full MS Cambrelle GORE-TEX® lining throughout. Safety boots with Steel Toe cap protection and Impact resistant to 200 joules. Dual density rubber sole with strengthened heavy duty lasting board. Defined 90° heel breast suitable for climbing irons, strengthened heel counter for increased ankle support. Flex zones on the back for comfort and flexibility. Goliath GoreTex Linesman Black Safety Boot conforms to: EN ISO 20345 S3 HRO SRC WR safety footwear standards. 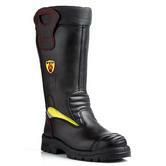 Black Leather fire fighter boot, with padded collar. It has handy, sturdy pull up hoops. Made in England, from a combination of both synthetic padding and natural leather water resistant Upper - for maximum effectiveness. Designed specifically to resist fire fighting hazards such as heat, water penetration and flames. These fire riggers are designed with side impact protection from cuts/sharp objects. The Vibram design rubber sole withstands 300 Degrees Celsius: ladder grips on the outsole. Ideal as Training Boots for Fire fighters: these Firemans pull on boots are often used by fire fighters for training - because they are so competitively priced. Flame Retardant Fire Fighters Safety Boot Fb4 conforms to: P9405 UK EN344 & EN345:2 ISO 20345:2011 SB-P HRO WRU Safety Standards. 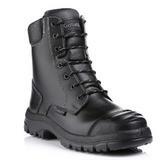 Goliath Flashmax foundry boot with Full grain leather upper with velcro protective overflap. New and improved flame resistant Dual Density Rubber injected sole with new high side wall. Heat resistant through the outsole and midsole to 300 degrees centigrade and SRC slip resistant. Lightweight aluminum toe cap resistant to 200 joules impact. Nail-proof textile midsole for 100% coverage of the foot. Flame resistant stitching Boots with Open cell PU footbed. Meets European foundry footwear safety standard EN ISO 20349:2010 S3 HI HRO SRC Fe. SuperTrax features a new Tri-density sole system that has up to twice the slip resistance specified by the European standard. The best ever slip resistance shoes for those working in food processing, janitorial and pharmaceutical industries. Additional stitching design features water resistant black leather. Goliath Franklin incorporates a steel toe cap plus a L-Protection nail-proof textile midsole. Goliath Franklin Supertrax S3 SRC Safety Trainers onforms to: EN ISO 20345:2011 - S3, FO, SRC safety footwear standards. Goliath Groundmaster safety chukka boots are durable and comfortable to wear. Suitable for the harshest tasks in the most demanding work environments. Black leather upper and all key seams double stitched for long life. Dual density PU/Rubber sport trainer sole, Oil, slip and acid resistant, Antistatic outsole. Goliath DLPM1011 Non Metal Safety Trainer conforms to: EN ISO 20345 S1P SRC HRO CI Nail-proof. Available in size - 11UK. Premium full grain Heinen leather with CROSSTECH® membrane to protect from the transfer of blood, born pathogens, water and provides total breathability to the wearer. Dual Density Rubber (DDR) injected sole with SRC slip resistance rating. Ankle protective disks, shock and energy absorbing heel zones. Fire retardant threads and stitching throughout with reflective Hi-Viz panels to the lateral sides. Steel toe cap resistant to 200 joules of impact, external ridged bump cap for longer life. Nail proof protective textile midsole resistant to 1500 Newtons. Removable and washable felt footbed with impact absorbent PU pads. Confimrs to EN ISO 20345:2011 S3 CI HI HRO WR SRC F2A HI3 P T AN, Meets Firefighter footwear standard EN ISO 15090. Size 9UK \ 43EU only. 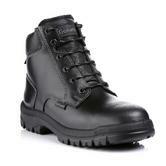 Goliath Footwear manufactures quality safety footwear for industrial markets. Goliath distributes into construction, utilities and civil engineering, light and heavy industrial and special hazard workplaces. Goliath partners with world-leading technologies such as GORE-TEX®, D30 and CORDURA®. We develop the best performing protective footwear for specialist industrial work environments, such as Firefighters, Welders and Offshore. The West Yorkshire distribution centre holds 150,000 pairs and is kept up to capacity by a factory which makes up to 10,000 boots and shoes every day. Goliath prides itself in being the leading producer of (DDR) Dual Density Rubber-injected soles on the planet. These sole ensure best durability and longevity of boots. Discover our Goliath catalogue featuring the ultra-tough Goliath Groundmaster and the other highly comfortable Executive line.